KLAUS GESING, BJORN MEYER, SAMUEL ROHRER-AMIIRA. Collaborations are nothing new. Musicians have been collaborating for over a hundred years. Some of the earliest collaborations took place between delta blues’ singers. Then as music evolved, and new genres were born, artists continued to collaborate. Especially jazz musicians, who have collaborated on many intriguing and innovative albums. However, as music continued to evolve and rock ’n’ roll was born, artists continued to collaborate. From the sixties onwards, artists and groups contained to collaborate. It didn’t matter what type of music they were making. Whether it was folk, pop, rock, reggae and soul, artists would collaborate. So would purveyors of avant-garde, psychedelia, progressive rock, Kominische and electronica. It was a case of never mind the genre, let’s collaborate. Some of the artists were from very different backgrounds. Other artists were from similar backgrounds, and shared a similar musical philosophy. This includes Klaus Gesing, Björn Meyer and Samuel Rohrer. Their paths had crossed over the years, and Klaus Gesing, Björn Meyer and Samuel Rohrer had become friends. They come from similar musical backgrounds, and share the same musical philosophy. So it was no surprise when Klaus Gesing, Björn Meyer and Samuel Rohrer decided to record an album together in March 2015. The resultant album Amiira, will released on Arjunamusic’s acoustic series on the 10th June 2016. Amiira is a showcase for three innovative musicians. These three musical innovators have known each other for some time. They’ve also played together, and even share a similar musical philosophy. Improvisation is at the heart of Klaus Gesing, Björn Meyer and Samuel Rohrer’s approach to music. This is the polar opposite to the way most groups record an album. When most groups arrive at a studio to record an album, the songs have already written. That wasn’t the case when Klaus Gesing, Björn Meyer and Samuel Rohrer arrived at the studio in Berne, Switzerland to record their debut album, Amiira. By then, the three musicians were all experienced musicians.The elder elder statesman of the group was Björn Meyer. He was born in Stockholm, Sweden in 1965, but nowadays calls Switzerland. Björn is a member of Asita Hamidi’s Bazaar and Bazar Blå, and previously, was a member of Nik Bärtsch’s Ronin and SNAG. During a recording career that’s lasted three decades, Björn has written, arranged, produced and played on a variety of different albums. However, never before had he recorded an album with Samuel Rohrer and Björn Meyer. Just like Björn Meyer, Klaus Gesing is an experienced musician and composer. He was born in Germany in 1968, and plays saxophone and bass clarinet. Klaus is a member of the Flip Philipp-Ed Partyka Dectet Dectet and the Norma Winstone Trio, and has previously, has worked as a composer, arranger and session player. So has Samuel Rohrer. Swiss jazz drummer and percussionist Samuel Rohrer was born in 1977. He’s a vastly experienced musician, who released his debut solo album Tree in 2005. Since then, Samuel has recorded with Ambiq, BraffOesterRohrer, the Peter van Huffel Quartet and Wolfert Brederode Quartet. He’s also been a member of the Colin Vallon Trio and Km3. That’s not forgetting Samuel’s work as an composer sideman, arranger and producer. All this experience would serve him well when work began on Amiira. Recording of Amiira took place in Berne, in Switzerland. This made sense, as Switzerland was home to Björn Meyer and Samuel Rohrer. Only Klaus Gesing had to leave the comfort of his home behind. At the studio, Klaus Gesing, Björn Meyer and Samuel Rohrer got the opportunity to put their musical philosophy into actions. At the heart of their musical philosophy, was improvisation. These instrumentals songs hadn’t been written beforehand. Instead, everything was off the cuff and improvised. It was like a conversation, that would take a few twists and turns, with instruments interacting with each other. This musical discourse should Klaus Gesing, Björn Meyer and Samuel Rohrer hoped, result in cinematic music that the listener could to meditate, contemplate and lose themselves in. The music would also inspire and invite ideas and images, which pour forth from the mind’s eye. With the musical philosophy in mind, Klaus Gesing, Björn Meyer and Samuel Rohrer began work on Amiira. Björn Meyer played bass; Samuel Rohrer drums and percussion and Klaus Gesing bass clarinet and soprano saxophone. A total of ten tracks were recorded. Seven of these tracks were written and arranged by the three musicians. The exceptions were Shine On Me and Minne, while Klaus wrote. Sirènes Sacrées was penned by Khachatur Avetisyan. These ten tracks became Amiira, the first album from Klaus Gesing, Björn Meyer, Samuel Rohrer. There’s an element of drama and mystery as drums and steel pans rumble and resonate on Shine On Me, which opens Amiira. Soon, the bass probes, before a wistful soprano saxophone plays. It adds to the cinematic sound, as the dubby drums and percussion resonate. They conjure up pictures of somewhere distant, dusty and exotic. Especially, as the midday sun shines and lonely travellers finds themselves far from home. By then, the sultry strain of the clarinet is taking centre-stage. Meanwhile, the rhythm section and percussion are playing supporting roles. They create a slow, steady backdrop. Later, drums are played pounded while cymbals crash and rinse. It’s the bass that provides the heartbeat, as the soprano saxophone soars above an arrangement playing its part in a beautiful, melancholy and cinematic soundscape. It paints pictures as it unfolds over nearly nine magical minutes. while Klaus Gesing, Björn Meyer, Samuel Rohrer fuse elements of dub, jazz, funk, fusion and rock. Straight away, the mystery and melancholia continues on Minne. This comes courtesy of the soprano saxophone, while drums and cymbals are caressed. Meanwhile, percussion is sprinkled across the arrangement as the bass begins to add an element of drama. By then, cymbals crash, bells rings and drums roll. Still, there’s a degree of melancholy and mystery. The drum rolls add an element of drama, while the soprano saxophone adds a sense of sadness, regret and yearning for something and someone. The tempo and urgency increases on Fulminate. It’s as if the trio are determined to vent their frustrations and mount a three man protest. A guitar rings out, as a wash of celestial, ethereal sounds encircle the arrangement. Soon, the rhythm section propel and power the arrangement along. It’s a frenzied and impassioned protest, with the thunderous, almost funky bass joining clicking, cracking drums and the wailing soprano saxophone. After a minute, the arrangement dissipates, leaving just a glistening, dramatic and elegiac wash. Before long, the protest continues, and the rhythm section pound and power their way across the arrangement. Drums pound and cymbals crash as the thoughtful soprano saxophone takes a more cerebral approach to the problem in hand. Later, it’s all change, as the rhythm section joins the soprano saxophone as the soundscape reaches a meandering, melodic and melancholy ending. It’s as if the rhythm section are exhausted after fulminating, while Klaus is spent after ruminating. A briskly strummed acoustic guitar opens Flimmer, which is an atmospehric soundscape. Percussion rattles, while bursts of thunderous drums pound. Briefly bursts of a haunting bass clarinet sound, and quickly play a starring role. It’s augmented by a chirping guitar, drums and percussion. Together, they create an atmospehric, moody and dramatic soundscape that invites the listener to let their imagination run riot. Percussion rustles, rumbles, rattles and resonates on After You Left. Meanwhile rolls of drums join a briskly plucked bass as a wistful horn delivers its plaintive cry. It speaks of hurt, heartbreak, yearning and despair. Meanwhile, the rhythm section frame the plaintive cry. However, the sombre sound of the horn is like a lament for a lost relationship, and lost love. From the opening bars, Source One has a cinematic sound. The subtle sound a horn meanders, while the bass is plucked and the persuasion rattles and rumbles. Soon, the understated horn is joined by the grizzled sound of the bass clarinet. By then, the tempo has risen, and rhythm section and horns sail across the arrangement. They bob and weave, playing around and above each other. Sometimes, they complement each other, other times acting as a musical foil. Mostly, they complement each other as they take part in a musical dialogue. At the heart of this dialogue, is a braying, blazing horn and a driving rhythm section. Then later, the arrangement dissipates, becoming understated, thoughtful and beautiful memory of Klaus Gesing, Björn Meyer and Samuel Rohrer at their cinematic best. There’s an almost mournful sound to the horn that encircles the arrangement to Clouds Below. Meanwhile, the pitter patter and chatter of drums and percussion sounds like raindrops falling from the Clouds Below. Their sound beats out what sounds like a secret code. However, the horn plays a lament. Maybe it’s for the latest recruit to the ranks of the angels as they look down at the Clouds Below? Refraction is just a short two minute track. However, it’s an intriguing musical experiment, where sound waves interact and change direction. They’re deflected, change direction and are transformed sonically. That’s the case as the bass rings out, drums join in and play with a hesitancy. This is deliberate, and is part of the musical instrument. Soon, cymbals are played delicately and briskly. They ring and resonate, as sonic explorers Klaus Gesing, Björn Meyer and Samuel Rohrer transform the recording studio to a laboratory, and in the process create intriguing and captivating music. Just like the other tracks on Amiira, What We Leave is an invitation from Klaus Gesing, Björn Meyer and Samuel Rohrer to the listener to let their imagination run riot. It’s impossible not to accept their invitation, and embrace what is a wonderfully cinematic album. Each of the ten soundscape on Amiira tells a story. The listener is left to interpret the dialogue between Klaus Gesing, Björn Meyer and Samuel Rohrer. This is a dialogue with a difference. There are no words. Instead, instruments are responsible for the discourse and dialogue. This works, and works well. The ten improvised soundscapes on Amiira are variously moving, elegiac and ethereal, to melodic, mesmeric, poignant and ruminative. Other times, the music is a plaintive cry, and a lament for lost love. Sometimes, the music is otherworldly, futuristic and robotic. Then on Fulminate, Klaus Gesing, Björn Meyer and Samuel Rohrer kick out the jams, and unite in a three man protest. In doing so, the listener hears a very different side to the pan European triumvirate of musical innovators. They’re masters of their craft, and have spent a career reaching the upper echelons of European improvisational music. Once they had arrived, it was a case of finding like minded musicians. Luckily, Klaus Gesing, Björn Meyer and Samuel Rohrer’s paths crossed. When this happened, they discovered that they shared the same musical philosophy. Part of this, was that improvisation was central to the music making process. 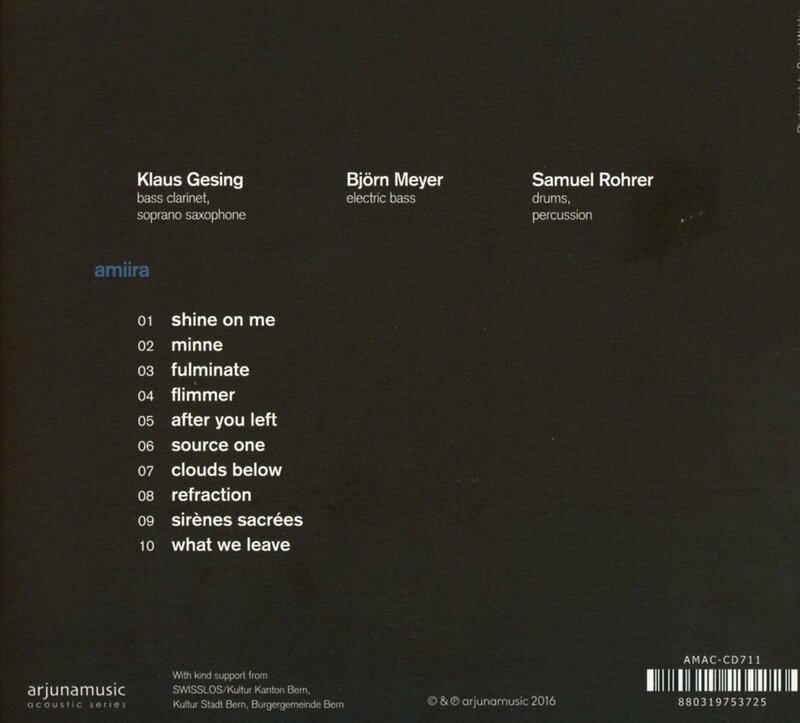 Klaus Gesing, Björn Meyer and Samuel Rohrer got the opportunity to put this into practise on Amiira, which will released on Arjunamusic’s acoustic series on the 10th June 2016. 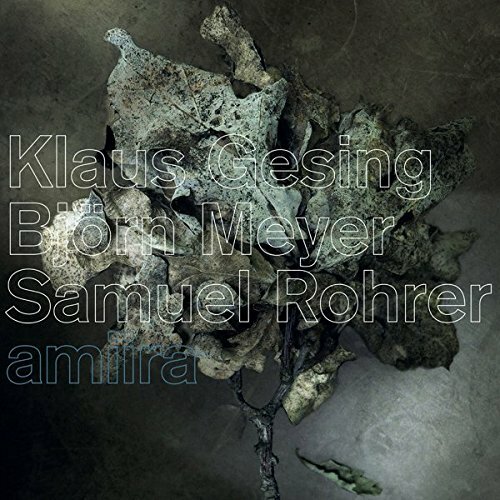 Hopefully, Amiira won’t be the only album that Klaus Gesing, Björn Meyer and Samuel Rohrer will release. They’re a talented triumvirate of innovative musicians, who are capable of creating cerebral, cinematic music. Amiira is proof of this. Klaus Gesing, Björn Meyer and Samuel Rohrer invite the listener to let their imagination run riot and lose themselves in this cinematic opus. It’s impossible not to accept their invitation to embrace what is a wonderfully cinematic and cerebral album, Amiira. ← LAU-THE BELL THAT NEVER RANG-S.A.Y.A. NOMINEE.